Jim McCurry accomplished a career of 39 years in systems engineering and program management on a diverse assemblage of major engineering programs spanning aircraft, manned space, scientific and defense satellites and computerized command and control systems for the Air Force, Navy, Army and NASA. 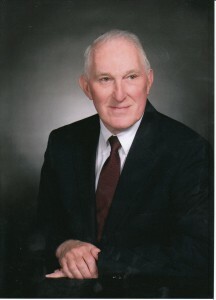 A native Kentuckian, he graduated from UK in 1953 with a degree in mechanical engineering. At UK, he was a member of Tau Beta Pi, Pi Tau Sigma, the Engineering Student Council and Omicron Delta Kappa. He was president of both Alpha Tau Omega fraternity and ASME. He received a graduate degree in aeronautical engineering from the Air Force Institute of Technology. He completed over four years of active duty in weapon systems program management offices at Wright Field, Ohio. From there he joined North American Aviation in California on the B-70 aircraft program. In early 1960 he joined the newly formed TRW Mercury Atlas Booster Program office as a systems engineer. On Mercury, he participated in the booster acceptance and launch of all the Mercury Atlas flights at Cape Canaveral, including the historic flight of John Glenn. After completing Mercury, NASA requested that the same team move on to do the same tasks on the Gemini program. Jim was responsible for systems engineering and technical direction of both the Gemini Titan II launch vehicle and the Gemini-Agena target vehicle. Once more, he was at Cape Canaveral for all of the Gemini program flights. After completing Gemini, he rejoined TRW in Houston as the Laboratory Manager supervising the TRW Systems Engineering support to the Johnson Space Center for all the Apollo manned flights. His group did the flight planning, crew procedures, mass properties, environmental control and experiments integration for NASA. His team was instrumental in support of all the Apollo flights including the first lunar landing and the recovery efforts of Apollo 13. For his Gemini manned space service, he received the Air Force Systems Command Outstanding Achievement Award and the NASA Manned Spacecraft Center Certificate of Commendation. For his service on Apollo, he received the NASA Headquarters Apollo Achievement Award. From manned space, he opened a TRW office at Huntsville, Ala., supporting the NASA High Energy Astronomical Observatory satellite program. Returning to Los Angeles, he was sent by TRW management to Washington to rescue a Navy command and control system contract facing cancellation. After successfully completing the Navy program, he returned to Los Angeles to head a Shuttle Payloads Program for infra-red detector crystal growth in the Shuttle Spacelab Module. Completing that program, he became the Systems Engineering Manager and the Chief Financial Officer on the Air Force Defense Support Program early-warning satellite. From there he became the program manager of an Army Command and Control computerized system update program. Completing that program, he became the deputy operations manager for TRW’s Command, Control, Communications and Intelligence Systems in the Systems Engineering and Development Division; a position he held until retirement from TRW in 1992. He is a registered Professional Engineer and an Associate Fellow in the American Institute of Aeronautics and Astronautics. His non-professional activities include troop scout master and explorer scout district chairman, as well as various church leadership positions. He resides in Rancho Palos Verdes, Cal., with his wife, Ann. They are the parents of five children and have eight grandchildren.